The human brain is the foremost part of the central nervous system, as well as the peripheral nervous system. The brain controls virtually all of the activity in the human body. Involuntary, or "lower," actions, such as heart rate, respiration, and digestion, are unconsciously governed by the brain; these actions are known collectively as the autonomic nervous system. Complex, or "higher," mental activity, such as thought, reason, and abstraction, is consciously controlled and is a fundamental part of the human condition. The complexity of the brain is vast. Containing around one hundred billion neurons, they are capable of electrical and chemical communication with tens of thousands of other nerve cells. Because of this, the human brain is considered the most complex in the animal kingdom. Anatomically, the brain is constructed of three parts: the forebrain, the brain stem, and the hindbrain; these sections are in turn constructed of small parts, such as the cerebrum and occipital lobe. The human brain is the source of the conscious, cognitive mind. The mind is the set of cognitive processes related to perception, interpretation, imagination, memories, and crucially language (cf. 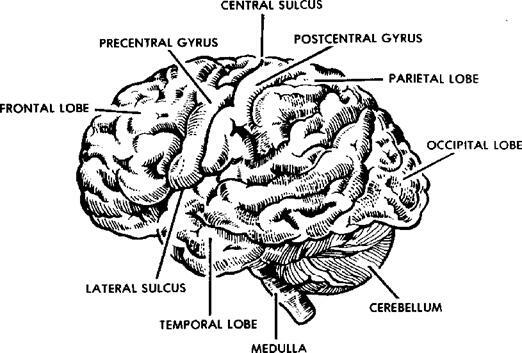 Broca's area) of which a person may or may not be aware. Beyond cognitive functions, the brain regulates autonomic processes related to essential body functions such as respiration and heartbeat. Extended neocortical capacity allows humans some control over emotional behavior, but neural pathways between emotive centers of the brain stem and cerebral motor control areas are shorter than those connecting complex cognitive areas in the neocortex with incoming sensory information from the brain stem. Powerful emotional pathways can modulate spontaneous emotive expression regardless of attempts at cerebral self-control. Emotive stability in humans is associated with planning, experience, and an environment that is both stable and stimulating. The 19th century discovery of the primary motor cortex mapped to correspond with regions of the body led to popular belief that the brain was organized around a homunculus. A distorted figure drawn to represent the body's motor map in the prefrontal cortex was popularly recognized as the brain's homunculus, but function of the human brain is far more complex. The human brain appears to have no localized center of conscious control. The brain seems to derive consciousness from interaction among numerous systems within the brain. Executive functions rely on cerebral activities, especially those of the frontal lobes, but redundant and complementary processes within the brain result in a diffuse assignment of executive control that can be difficult to attribute to any single locale. Midbrain functions include routing, selecting, mapping, and cataloguing information, including information perceived from the environment and information that is remembered and processed throughout the cerebral cortex. Endocrine functions housed in the midbrain play a leading role in modulating arousal of the cortex and of autonomic systems. Nerves from the brain stem complex where autonomic functions are modulated join nerves routing messages to and from the cerebrum in a bundle that passes through the spinal column to related parts of a body. Twelve pairs of cranial nerves, including some that innervate parts of the head, follow pathways from the medulla oblongata outside the spinal cord. A definite description of the biological basis for consciousness so far eludes the best efforts of the current generation of researchers. But reasonable assumptions based on observable behaviors and on related internal responses have provided the basis for general classification of elements of consciousness and of likely neural regions associated with those elements. Researchers know people lose consciousness and regain it, they have identified partial losses of consciousness associated with particular neuropathologies and they know that certain conscious activities are impossible without particular neural structures.